Virgin Galactic test pilots broke Mach 2 on July 26, as VSS Unity took her third rocket-powered supersonic outing in less than four months. After a clean release from carrier aircraft VMS Eve at 46,500 ft, pilots Dave Mackay and Mike “Sooch” Masucci lit the spaceship’s rocket motor before pulling up into a near vertical climb and powering towards the black sky at 2.47 times the speed of sound. 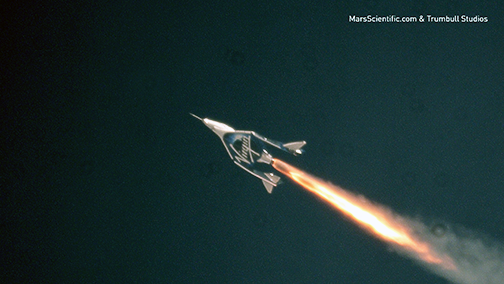 Virgin Galactic's third powered flight. 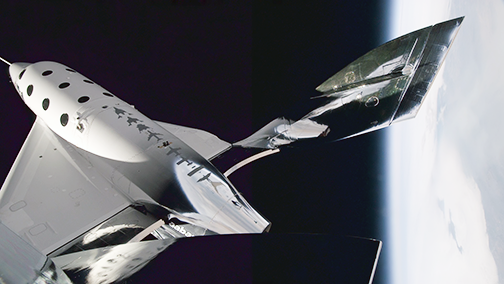 Photo is courtesy of Virgin Galactic. The planned 42 seconds rocket burn took pilots and spaceship through the Stratosphere and, at an apogee of 170,800 ft, into the Mesosphere for the first time. This region, often referred to by scientists as the “Ignorosphere”, is an under-studied atmospheric layer as it is above the range of balloon flight, and in the future is an area we can help the research community explore further. Every time VSS Unity is tested on the ground, or in the skies, the company gains invaluable experience and fresh data. This continuously improves modelling and helps to optimize objectives and test points as the firm progressively expands the flight envelope. Today’s test, among other things, gathered more data on supersonic aerodynamics as well as thermal dynamics. As it has been on previous flights, Unity’s cabin was equipped to gather data vital to the future safety and experience of astronaut customers. These cabin analysis systems record a host of parameters that are designed to help us further understand the environment inside the cabin during powered flight — temperatures, pressures, humidity, acoustics, thermal response, vibration, acceleration and even radiation. The carrier aircraft, VMS Eve, was piloted today by Todd Ericson and Kelly Latimer. Congratulations to all at Virgin Galactic and The Spaceship Company for achieving another significant step toward commercial service. With VSS Unity, VMS Eve and the pilots safely back on the ground, Virgin Galactic will now analyze the post-flight data as we plan and prepare for our next flight. To learn from the world’s foremost experts about exciting innovations and missions, such as the one mentioned above, and how this technology will affect your business, attend Satellite Innovation 2018.